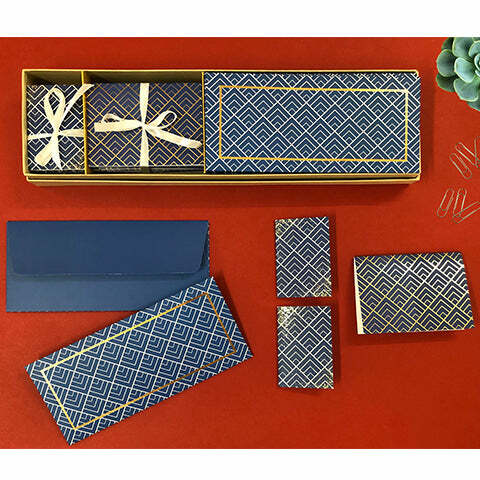 This set of 12 coordinated cards and intricate screen printed envelopes from our Agra collection is inspired by our travels and our love for elephants. The victorious emperor atop the majestic Indian elephant is welcomed with a shower of flowers. The beautiful screen-printed geometric pattern on the envelope liner depicts the walls of the baby Taj, Itimad-ud-daulah. The folded card is an ode to our gentle giants that have been mistreated over centuries. By purchasing this collection, you are supporting the rehabilitated elephants residing at the Wildlife SOS’ Elephant Conservation and Care Center in Mathura nar Agra, who have been rescued from abusive conditions across India.